Among the X-ray methods applied for non-destructive testing of industrial objects imaging techniques are the most common, yielding morphological information based on the spatial variation of the X-ray attenuation. Thereby, physical defects like flaws or inclusions can be detected but usually no material specific information is obtained apart from the coarse discrimination of elements resulting e.g. from dual-energy techniques. X-ray methods used in material science like X-ray diffraction or fluorescence, on the other hand, allow discrimination with high specificity. In contrast to X-ray fluorescence, which is primarily used to identify elements, X-ray diffraction enables to determine the crystalline structure of the investigated material and thus to identify its chemical composition by comparison with reference data. In order to combine the information from X-ray imaging and X-ray diffractometry a non-destructive technique for measuring coherent X-ray scatter was developed called Energy Dispersive X-ray Diffraction Tomography (EXDT)  or Coherent X-ray Scatter (CXRS) analysis. Meanwhile the feasibility of coherent scatter methods has been investigated for selected medical, industrial and other X-ray applications. The most promising area, the detection of explosives and drugs in airport baggage [2,3], lead to a product development initiated by Philips Industrial X-Ray and now carried out at YXLON International. Here the task comprises the identification of certain substances within bulk objects based on their coherent scatter data. In the field of industrial NDT the identification of foodstuff contaminants and other inclusions was investigated [4,5] aiming at the development of new means for production control. Apart from material identification the employed principle of measurement allows quantification of material components as well as their localization and texture analysis within bulk objects. This may offer new solutions for industrial NDT problems. In view of the large variety of these problems, however, general predictions on the success of the coherent scatter technique in NDT can hardly be made and its exploration is further hampered by the fact that the method is still virtually unknown to possible users. During the past years an experimental system for coherent scatter measurements on bulk objects was set up at the Physics department of the University of Wuppertal, Germany. The apparatus was designed to allow flexible change of the scatter geometry enabling to assess the applicability of the method with respect to different inspection tasks. This is further supported by a simulation program allowing to predict diffraction patterns based on literature data (Powder Diffraction File, PDF). Both simulation and experiments were applied successfully within a study focussing on the identification of pigments used in ancient paintings . For a broader assessment of the potential of coherent scatter for industrial NDT a collaboration between YXLON International and the University of Wuppertal was established. Currently the investigations are focussing on the following subjects: system optimization by means of simulation, investigations on amorphous substances and liquids and the assessment of new applications. Here we will give some examples of first results obtained within this collaboration. (Note: Only first order diffraction is considered). (h: Planck's constant, c: velocity of light). Obviously DQ can not be made negligibly small in a real experiment because a certain width A of the scatter collimator slits is necessary for sensitivity reasons. Fig.1 further shows that the size of A together with the diameter of the X-ray beam Dbeam not only determine the an gular blurring DQ of the system (line resolution) but also the size of the regionofinterest (spatial resolution). From (3) it further follows that the described behavior strongly depends on the chosen scatter angle, which in turn is related to the lattice spacings to be observed. The (mean) angle Q can be varied in the experiment by altering the distance L between the two collimator diaphragms whereas Dbeam is defined by means of the dimensions of a primary collimator (pin hole, not shown in Fig.1). The above statements indicate that proper design of the scatter collimator and optimum choice of the other experimental parameters are crucial in order to balance the requirements of line resolution, spatial resolution and sensitivity. Spatially resolved investigation of a whole object, if necessary, is accomplished by moving it with respect to the apparatus, i.e. the ROI. Thereby, scatter images may be obtained by appropriate 2-dimensional display of the acquired data . Since the method is based on X-ray diffraction, identification with high specificity is lim ited to crystalline materials. However, as shown below some information may also be gained from liquids and amorphous substances. The limits in spatial resolution (mainly in the direction of the beam) may complicate the interpretation of the diffraction data if more than one material is present in the ROI. The restricted line resolution leads to a limited specificity in terms of material discrimination compared with powder diffractometry. Due to the fact that the measurement is carried out "in-situ" the method is implicitly sensitive to texture within the object. This may be an advantage if the texture is subject of the investigation. It may also be a disadvantage, however, since relative peak heights can in general not be expected to be identical with those from reference data. Although the principle of coherent X-ray scattering allows nondestructive identification, lo calization, quantification and texture analysis of materials within bulk objects the achievable specificity and accuracy is an open question for a given inspection task and each application requires individual optimization of the setup. The main system parameters to be chosen are the scatter angle as well as the scatter collimator slit width and the diameter of the incident pencil beam. Thereby, resolution and sensitivity can be adapted to the needs of the given inspection task. In order to facilitate this process a simulation program was developed at the University of Wuppertal utilizing a ray tracing algorithm to calculate the diffraction pattern of a material with given lattice spacings d to be observed. The d values, known e.g. from PDF-data, together with the given system parameters and the spatial composition of the object serve as input parameters of the program. As a result of the ray tracing evaluation of all possible X-ray paths the blurred diffraction pattern is obtained. By repeating this step with different system parameters the optimum configuration for a given inspection task can be determined without time consuming experiments. In order to demonstrate the potential of the coherent X-ray scatter method two modern aluminum composite materials were chosen as examples: an Al/Si-composite (AlSi17Cu4Mg1) and an SiC-reinforced Al-composite. Figs.2 and 3 show normalized diffraction patterns of a part made from the Al/Si-composite. Fig 2: Normalized diffraction patterns measured from an Al/Si-composite. The reflecting atomic planes are denoted by Miller indices. The mean scatter angle is changed from (approx.) 3.3° to 5.7° leading to a strong increase in line resolution and a larger number of observable diffraction peaks. Fig 3: Normalized diffraction patterns at a mean scatter angle of 5.7°: Measurement of the Al/Si-composite (upper trace), reference data (simulated from PDF) from Al and Si (lower traces). The peaks observed within the composite pattern are verified by the simulated reference data. The reflecting atomic planes are denoted by Miller indices.In Fig.2 the significant increase in measured line resolution resulting from a change in the scatter angle from 3.3° to 5.7° (approximate values) is demonstrated (see e.g. the peaks (220) of Si and (200) of Al). Furthermore, the number of scatter peaks observed within the energy range of the primary X-ray spectrum is strongly enhanced. For the purpose of demonstration all spectra shown were acquired using long sampling times (several hundred seconds for the scatter spectra) aiming at a high signaltonoise ratio. These times do not reflect the experimental conditions within a real inspection application which will depend on the individual task, the used X-ray source, scatter geometry and data processing. As explained above system optimization can be accomplished or facilitated by means of simulation. The diffraction pattern of the Al/Si-composite is shown again in Fig.3 together with patterns from its major constituents, Al and Si, calculated by means of the simulation program based on their PDF data.The peak positions in the observed sum spectrum (upper trace) are clearly identified within the calculated individual spectra of Al and Si. Apart from the peak energies the widths of the measured spectral lines turn out to be in good coincidence with the simulated data, demonstrating the performance of the simulation program. Reference data may also be obtained from measurements. This is demonstrated in Fig.4. displaying the scatter pattern of an aluminum matrix composite containing 20% ceramic particulate (SiC) reinforcements. The diffraction data were taken at a scatter angle of 5.7° and compared with reference measurements from pure Al and pure SiC samples. Again the two constituents are clearly identified in the sum spectrum. According to the specifications of the material a smaller percentage (<10%) of Si should be part of the matrix alloy. This may be indicated by the enhancement of the peak observed at 40 keV (Si (111)) within the measured spectrum. Provided that the influence of texture can be neglected the percentages of Al and SiC within the composite may be determined from the individual peak areas by comparison with reference data taken from samples of equal size and position. Calculations based on the major scatter peaks shown in Fig.4 gave a percentage of 18% to 23.6% for the SiC content in the composite depending on the investigated point within the object and the peaks included in the evaluation. Apart from the relatively large deviation and taking into account a potentially inappropriate choice of the reference materials the result is in good agreement with the value of 20% specified for the material. Firstly, based on exact knowledge on the production process a better choice of the reference materials can be made. Secondly, existing data concerning the (wanted or unwanted) texture within the material may be used in the evaluation. If the investigated material exhibits significant unknown texture, however, the measured relative peak heights may unpredictably differ from those obtained from simulations or reference measurements. This must be regarded as a disadvantage with respect to material identification or quantitative material inspection. On the other hand it allows to study the orientation of material constituents within the lattice, which might turn out to be a helpful additional source of information in the context of specific inspection tasks, e.g. in the field of process development. Fig 4: Normalized diffraction patterns measured at a mean scatter angle of 5.7°:Al/SiC-composite (upper trace), reference measurements from Al and SiC (lower traces). The peaks observed within the composite pattern are verified by the reference data. Although X-ray diffraction is a technique, which is primarily suited for the analysis of crystalline structures, characteristic patterns are also obtained from amorphous substances and liquids. Due to the absence of fixed lattice spacings no distinct peaks appear in the energy spectrum but the observed broad diffraction patterns display characteristic shapes depending on the investigated material, too. Although these are less specific compared with that of crystalline substances they may still allow identification especially in cases where only a selection between a few possible constituents of the object has to be made. As a further complication, the prediction of diffraction patterns from liquids and amorphous materials is much more difficult as compared to crystalline substances since simulations on the molecular dynamics have to be performed in order to determine the pair correlation function for each combination of the different elements present . The obtained data allow calculation of the diffraction pattern of the substance for comparison with the experiment. An example demonstrating the possibility to discriminate two liquids based on scatter measurements is shown in Fig.5. The honeycomb structure representing a part of an aircraft wing was prepared with two different liquids (water and kerosene) each filling one of the honeycombs. Obviously the difference can not be identified within the conventional X-ray image (left). The diffraction patterns taken from points A and B shown in the right part of the figure, on the other hand, clearly indicate which of the fluids is present in the corresponding honeycomb. 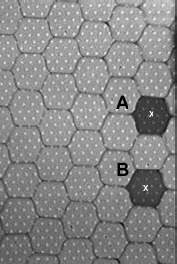 Fig 5: X-ray image of a honeycomb structure representing a part of an aircraft wing (left).Two honeycombs were filled with different liquids (water and kerosene). Normalized diffraction patterns from points A and B of the object observed at a mean scatter angle of 3.3° (right) allow to distinguish water from kerosene. Additional peaks result from the aluminum structure. As another example representing amorphous materials a carbon fiber reinforced epoxy resin was investigated (Fig.6). Although for amorphous substances the observed diffraction peaks are significantly less intense as compared to those of the crystalline samples, here the main features of the scatter pattern of the composite can still be explained by those of the constituents. Fig 6: Normalized scatter patterns observed at a mean scatter angle of 3.3°: carbon fiber epoxy composite (upper trace), reference measurements: carbon fiber and epoxy (lower traces). The main characteristics of the scatter patterns from both constituents are found within the composite pattern. According to the fact that so far a broader range of applications of coherent X-ray scattering in nondestructive testing on industrial objects has not been identified, in this paper the potential of this technique was presented by means of selected examples. The scatter angle as well as the other geometrical dimensions of the scatter system are crucial parameters with respect to the applicability of the technique to a given task. The experimental setup used here enabling flexible choice of these parameters together with the described means for simulation of diffraction patterns provide a very suitable environment for the optimization and validation of the technique. System optimization is especially important in view of the large differences with respect to industrial inspection tasks as well as the large variety of system parameters to be properly adjusted. In a further step a combination of the X-ray scatter analysis with conventional X-ray imaging is possible, e.g. to allow measurement of spectra from points within the object selected previously by means of a X-ray image. It can be expected that in most of the envisaged inspection tasks the materials to be identified or quantified belong to a well defined limited set. Here comparison with reference data will be easy and even in the case of amorphous substances and liquids conclusive results may be obtained. We thank the following companies for providing samples of material and data: PEAK Werkstoff GmbH, Velbert; Honsel GmbH&Co KG, Meschede; COMAT GmbH, Kaiserslautern.